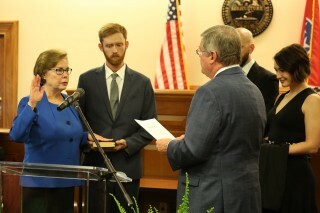 Longtime Nashville litigator Patricia Head Moskal was recently sworn in as the newest chancellor on the 20th Judicial District Chancery Court during a ceremony at the Metropolitan Courthouse in Nashville. In January, Governor Bill Haslam appointed Chancellor Moskal to the position on the court, which serves Davidson County. Chancellor Moskal takes the place of Chancellor Claudia Bonnyman, who retired at the beginning of the year. A wide array of Chancellor Moskal’s former and new colleagues attended the ceremony at the courthouse. Fellow 20th Judicial District Chancellor Ellen Hobbs Lyle warmly greeted Chancellor Moskal and spoke of the importance of the judiciary. Stevenson said that Chancellor Moskal was an inspiration not only during work hours, but after as well when she volunteered her time to a host of organizations serving the public and the profession. To name just a couple, Chancellor Moskal has served as both president of the Marion Griffith Chapter of the Lawyers’ Association for Women and as first vice president and board member of the Nashville Bar Association. Tennessee Supreme Court Chief Justice Jeff Bivins swore in Chancellor Moskal, who was in the company of her two sons and her daughter-in-law. Like Stevenson, Chief Justice Bivins is a former colleague of Chancellor Moskal’s. After she was sworn in, Chancellor Moskal took the time to thank many of the people who helped her throughout her career, including her former law family at Bradley Arant Boult Cummings. She also thanked former Governor Haslam for appointing her, her fellow chancellors, and former Chancellor Bonnyman. “I will do my best to live up to the legacy that she has begun through her many years of distinguished service,” she said. Chancellor Moskal remarked on her own personal journey, including how she grew up one of eight children in Indiana. She was the first of her family to attend college, and the first to become a lawyer. Her devotion to her profession really flourished during her time at the University of Tennessee College of Law. Although a new addition to the bench, Chancellor Moskal said she has already learned valuable lessons that she will take with her for the rest of her judicial career. Before earning her J.D. from the University of Tennessee College of Law, Chancellor Moskal received a B.A. in psychology from Indiana University Bloomington. She worked as a teacher and counselor in Chattanooga prior to the start of her legal career. She practiced with the law firm of Bradley Arant Boult Cummings since 1985 and became a partner in 1992. While at Bradley, she served on the firm’s diversity, recruiting, and pro bono committees and provided regular pro bono service throughout Middle Tennessee. A number of judges attended the swearing in ceremony, including Chancellor Lyle, Chancellor Russell T. Perkins, Justice Bivins, Justice Connie Clark, Court of Appeals Judge Richard Dinkins, Court of Appeals Judge W. Neal McBrayer, Senior United States Circuit Court Judge Martha Craig Daughtrey, Circuit Court Judge Joe Binkley, Circuit Court Judge Randy Kennedy, Circuit Court Judge Kelvin Jones, Circuit Court Judge Amanda McClendon, Circuit Court Judge Thomas Brothers, Criminal Court Judge Mark Fishburn, Criminal Court Judge Jennifer Smith, and General Sessions Court Judge Melissa Blackburn.